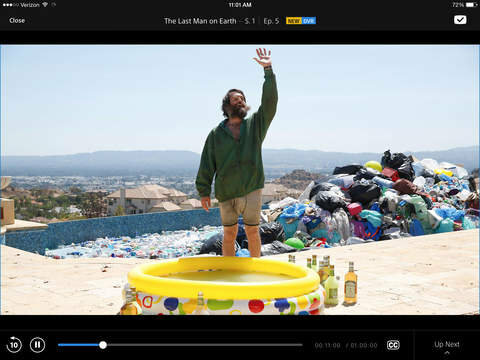 The Vue iPad app offers live and on-demand access to shows, movies, and sports. Both shows and channels can be marked as favorites, and tagging a show will keep its most recent content saved in cloud storage for up to 28 days. A number of limitations exist though, as Vue is currently only available in Chicago, New York City, and Philadelphia, and the iPad app requires that users already have a subscription attached to a PlayStation 3 or 4. And while Vue includes access to over 50 channels, some shows and networks are blocked on the iPad due to licensing issues. Vue first launched in March, and costs between $50 and $70 a month depending on the channel bundle. Its main rival —Dish's Sling TV —starts at $20 and is offered across the U.S. and on more platforms, but offers a smaller assortment of default channels. An Apple subscription TV service has been rumored for some time, and at one point was expected to be teased at Monday's WWDC keynote. An announcement appears to have been delayed, however, because content providers are still at odds with Apple over pricing, rights, and backend technology issues. The lack of a TV service may also have been one reason for postponing the introduction of a new Apple TV set-top. That device is expected to get Siri voice commands, an App Store, and a touch-based remote.